Learn to assess the drivers of organizational performance. How do you measure the key drivers of performance? How do you use those to create change? Vital Signs are statistically validated measures that capture key information about the people side of performance. 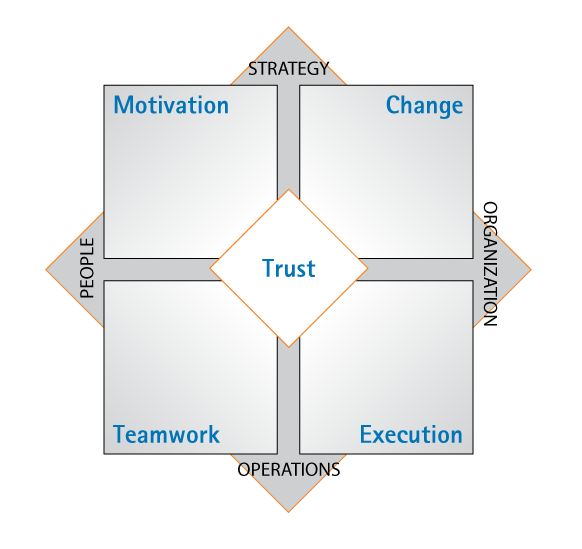 Built on a model with solid business logic as well as sound science, the tools connect people’s perceptions and attitudes with hard business outcomes in an actionable, practical framework. Vital Signs are statistically validated measures that capture key information about the people side of performance. Built on a model with solid business logic as well as sound science, the tools connect people’s perceptions and attitudes with hard business outcomes in an actionable, practical framework. Gain insight on leadership effectiveness. Measures drivers + leadership outcomes: Influence, Efficacy, Design, Direction. Identify opportunities and obstacles for optimal group performance. Measures drivers + team outcomes: Satisfaction, Results, Agility, Sustainability. Measure key indicators of organizational climate across the enterprise. Measures drivers + org outcomes: Retention, Productivity, Customer Focus, Future Success. Create a strategy that works with and through your people. Quantify the people-side of the organization. Accurately assess the effectiveness of development initiatives. Identify needs and opportunities for training, communication, and development. Focus and build buy-in for change efforts. Upon completion of these steps, you earn the Vital Signs Consultant Certification and “active” status in the Six Seconds online intranet. Date: 21 & 22 November 2013. Venue: Merchant Court Hotel, Singapore. Early Bird Fee: SGD1895 (if paid by 11 October 2013).